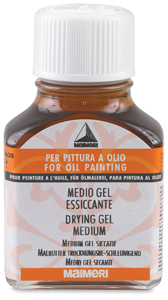 Drying Medium — Reduces the drying time and consistency of oil colors. Highly flammable. Drying Gel Medium — Reduces the drying time of oil colors, while leaving their viscosity unchanged.It's housed in a glass bottle with a twist-off cap. Highly flammable.